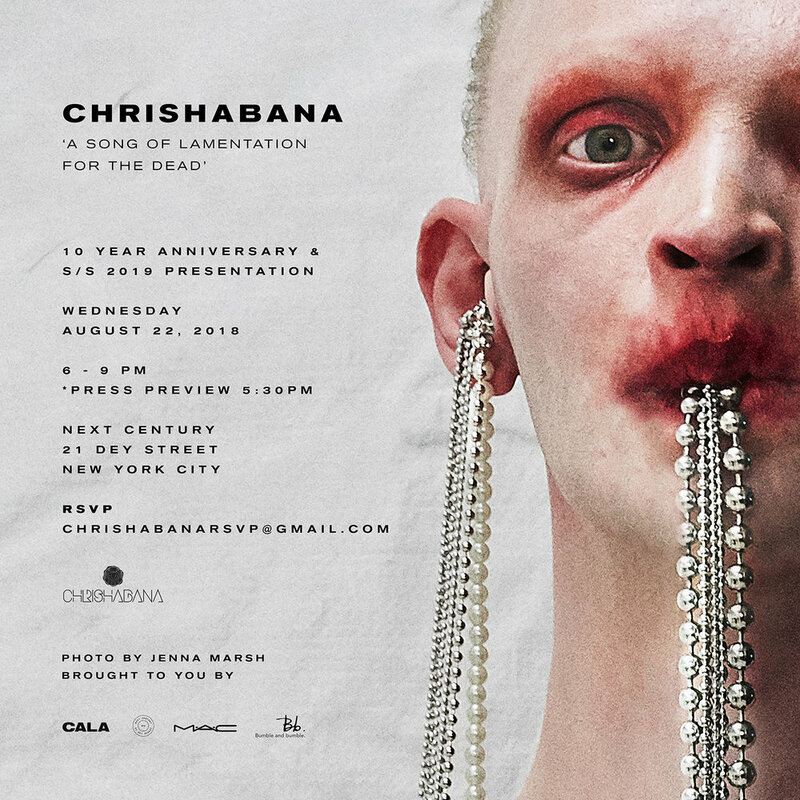 As CHRISHABANA celebrated its 10th anniversary, the namesake designer commemorated the accomplishment with the debut of his Spring/Summer 2019 collection at Next Century. In true CHRISHABANA fashion, the presentation diverted from the typical joyous celebration expected for such a milestone and found home in the somber, reflective mood of funeral processions. Models stepped out one by one onto a brightly lit minimal platform blanketed in opaque tarp (designed by Reni Menaj) as exaggerated ball chain, barbed wire, and latex pieces wrapped tightly around their bodies. Billowing smoke washed over the models and flooded out into the crowd mimicking incense delivering prayer heavenward. One model entered gently ringing bells, a subtle acknowledgement of death and moreover transformation. Another model clad in a latex nun habit lovingly caressed a cross hanging from her neck, journeying into the afterlife with faith and earnest. Although funerals traditionally signify a parting or unfortunate end, the collection symbolized Chris paying respect to his body of work and the lessons experienced therein, while looking on confidently toward the next phase of CHRISHABANA’s existence. 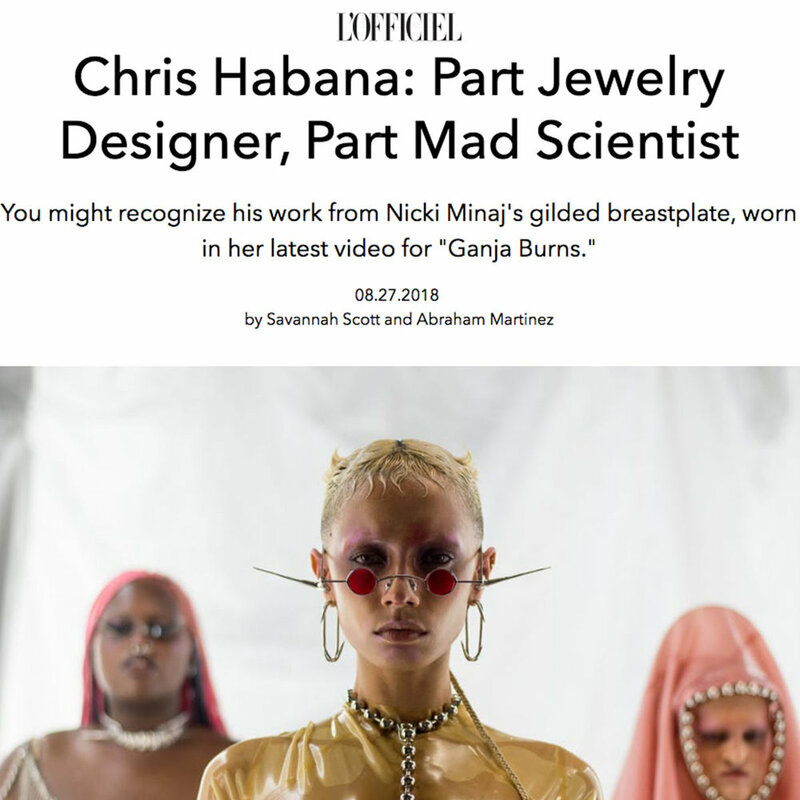 CHRISHABANA collaborated with talented creative director Jenna Marsh to create striking video campaign released ahead of the presentation’s debut. Chris’ signature penchant for sci-fi imagery and a focus on the anatomy is fleshed out in a clinical scene where dazed subjects are examined and fitted in pieces from the collection. Still images were also incorporated into formal invites sent to our guests.